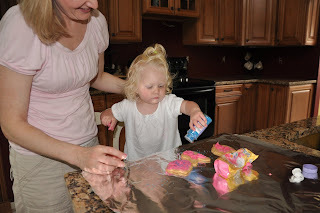 Our weekend project this weekend was to bake and decorate Easter cookies. 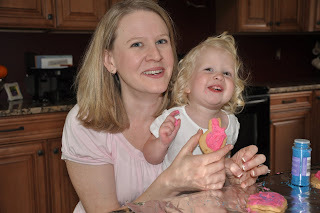 It was a rainy Saturday, not much to do outside, so cookie baking was a great project for Lallie and I. First we had to get cookie cutters. 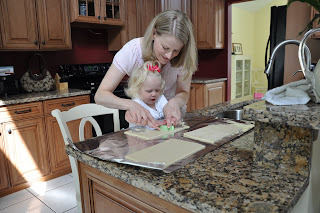 Did you know that Publix and Winn Dixie both sell cookie sheets for making Easter cookies, but don’t sell cookie cutters? Well, after searching in two stores for the cutters, we finally had to drive all the way to Jensen Beach (which is about a 20 minute drive near the Treasure Coast Mall) to go to Michael’s to get the cookie cutters. A big storm was brewing, lots of dark clouds, but Lallie and I agreed that we could make it in and out before the rain came. WRONG! We had to run in the rain to the car, which actually turned out to be quite enjoyable. LallieLOVED running in the rain and getting wet. She laughed and stuck her head and hands into the air with a huge smile. Seeing her enjoy it so much, made me enjoy it a little more and when we got into the car, she laughed at the wet drops on her arms and hair saying “What happened?” See, it hasn’t really rained since September, long before Lallie could really communicate and tell us her feelings. She also hadn’t been one to notice things so easily on her own. So, this was really the first rain she’d fully experienced. I’m glad to have experienced this simple pleasure with her it with her and think it will be a while before I take rain for granted again. Let the decorating begin! 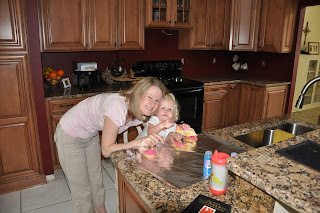 We washed our hands and then I taught Lallie how to squeeze the tube of pink icing (of course, any other color just wouldn’t do). 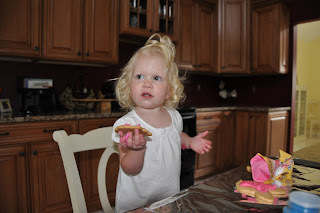 Then I showed her how to use her finger to spread the icing on the cookie. Now, Lallie is a very dainty, girly-girl. She has been since day one. She eats her food like an English royal, her pinky finger up in the air as she carefully grabs food between her thumb and forefinger. She covers her mouth to sneeze and cough (but only after the sneeze or cough has happened, we’re working on that) and she uses a napkin to wipe her hands and mouth after dinner. She even grabs her own Kleenex, well handful of Kleenex’s to wipe her nose. So, when Lallie got icing on her finger, she held it up to me with the look of desperation and then in her language which only Stuart and I can understand, promptly said, “Ewww, get it off mommy!” So, I smeared the icing for her and then we moved onto the bright blue sprinkles. 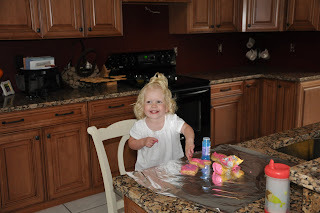 Lallie caught onto this real quick and loved sprinkling the cookies even more than eating them! 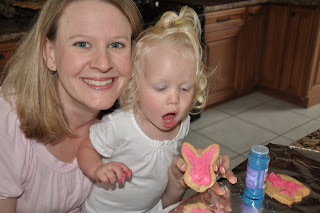 While I cleaned up our pink and blue mess, Lallie ate her bunny rabbit eared cookie with great enthusiasm, making sure to pick up and eat any crumbs that had fallen on the floor. Husband had taken a break from remodeling our bathroom, so he was playing with Lallie and our dog, UK. He was egging the dog on and telling him to go get the cookie. Lallie thought it was funny and would scream, run away and then turn around to say “No, UK, Out!” while pointing her finger towards the door. This went on a few times until UK finally won and snatched the cookie right out from Lallie’s hand. Her face became extremely red, she glowered at UK and then one single, but very large, tear streamed down her face as she started to cry desperately. After all, her cherished, hand-made cookie had just been stolen by the mean, mangy dog! Stuart immediately got Lallie another rabbit-eared cookie, mommy hugged her and wiped the tear from her eye, and then all was well with the world once again! Lallie started Montessori school in January at eighteen months old and she has absolutely thrived. Her dexterity and language skills have improved, she is putting together puzzles and nesting blocks, sorting shapes and colors, and is now drinking from a cup, eating with a fork and spoon and has become a big girl right before our eyes. And these are only a few of the new skills she has learned. 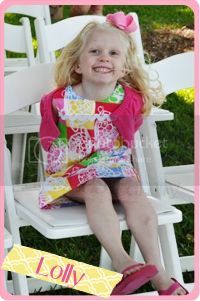 We have also learned a few things about parenting and about Lallie's personality. She is a mathematical thinker (oh, help me...for those of you who know me well, my dad and my husband are engineers and it looks like I have another following in their lead!) She doesn't play with dolls, her activity table is a game of the past, chasing balls around the house only occupies her for so long, and she doesn't really enjoy riding a tricycle or playing with her kitchen. Not that these aren't enjoyable activities, they are just worn out games and she prefers to be challenged with new and exciting things. For example, the other day, she was trying to put together the reverse-osmosis system that is currently sitting on our porch due to our kitchen remodel! She loves Legos, nesting blocks, puzzles etc. Her little mind, just like any toddler's, is working and thinking at a million miles a minute. We are parents, as teachers, need to cater to that quickly moving mind. Since we're not teachers by trade, it's been difficult for us to understand what Lallie needs. We don't have the formal teaching education and I'm sad to say that I haven't read any parenting books (ah, the plight of a full-time working parent). 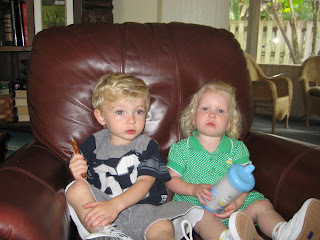 At school, Lallie gets a full day of stimulation, both with other children and constant adult interaction. This is great! Exactly what Husband and I hoped for and want (and are paying). However, when she gets home and on the weekends, Lallie can be very irritable and needy. I now realize that she wants the boundaries and activities, she wants to be focused, she wants to learn and explore. She's not in my way when I'm cleaning house, she's just interested in what I'm doing, soaking it up, learning all that she can absorb into her ever growing mind! 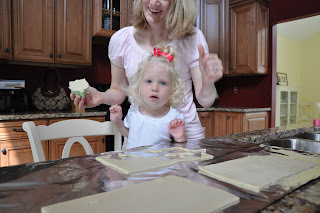 These are all things I've learned from the Montessori teachers. I have also been told that I shouldn't be so hard on myself for just now recognizing it. In fact, Ms. Kelley said most parents (aside from teachers!) don’t realize this with their first child until well into it, it is normal it’s a learning process like anything else. I am not the first parent to ask the question, “what are we doing wrong at home?” And the answer is, “nothing.” We're not teachers by definition of our job titles, we're engineers and commercial real estate managers, and we know NOTHING about children. We've also learned that our child isn't suffering because of our lack of teaching education, she's actually learning from us and she loves us, the most important part. I've always known we are teachers, not just parents, but for the first time, I'm actually realizing the implications of being a “parent-teacher”. Husband and I have decided to put away the toys that Lallie currently views as pointless. (Seriously, she picks up a doll and looks at it with the expression "what am I supposed to do with this?" and then throws it to the side - not that she won't enjoy playing dress up with them later in life). We are setting up her room and our living room with boundaried alone and parent-interactive activities based on the Montessori school method. 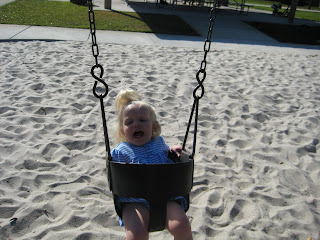 She enjoys it, that’s what she likes and people always say that kids need boundaries. That's what we're giving her. And, when mommy and daddy need that second on the weekend to run to the restroom or the laundry room without a crying fit, maybe these activities will help her stay focused and happy. In addition, she can actually help us, after all she will be sweeping the floor, helping with dinner and washing the windows! 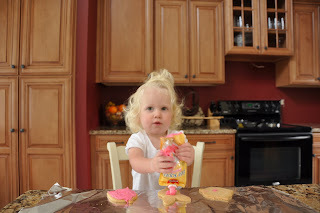 I am so looking forward to our activity of cookie decorating and then park playing with Lallie tomorrow. It's going to be fun and rewarding for us all, exactly what I want for Stuart and I as parents, and what we pray, for Lallie as a child. Pray for us, we'll let you know how it goes! Every month, when I get my magazines in the mail, whether it be Working Mother, Better Homes and Gardens or Parenting, I immediately sit down and quickly flip through the pages to see what interesting things I'll get to read for the month. I just got my April Parenting and on the first page was a "Hot Dad of the Month" spoof with a picture of a dad and his three year old son. Below the picture was a comment by Parenting asking people to send in their pictures and statement for next month's "Hot Dad." 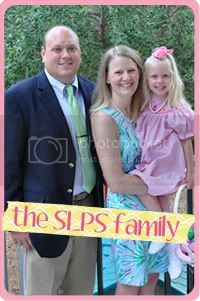 Now, I'm not one to enter contests and send in pictures to magazines to show off my family to the world....BUT, this is my blog and I WILL show off my family to the world here in Family Life. So, tell me? Isn't the picture below perfect for "Hot Dad of the Month/Year/Lifetime"? Well, maybe not to everyone else, but to to Lallie and I, that's a big YES! Lallie had found a leaf on the ground and it took her a while to warm up to it! When she first saw the leaf, it was laying on the driveway, she inched carefully towards it as it was an odd looking shape, not like other leaves we've seen. Just as she got ready to pick it up, the wind caught and it moved a couple inches. Well,Lallie 's eyes became filled with fear and she ran to me insistent that I immediately pick her up. She watched that leaf without a flinch until it moved again and she gripped me in a tight hug. She was very scared of the leaf. Finally, I was able to convince her that the leaf really was not going to hurt her, and here's the picture I got of her with her new friend. Lallie is also learning how to use a spoon and fork, she is very good at eating yogurt and cereal all by herself from a bowl without making too much of a mess. We're still working on scooping, but she's getting there. Lallie is missing her daddy quite alot while he remodels our bathroom. He's doing a great job and we love him very much and can't wait until he's done so we can have fun family days again. Here's a picture of Lallie wearing daddy's hat. She became very concerned today when she found his hat. Daddy always works in his hat and since he wasn't wearing it, she became very worried that he wouldn't be okay without it, "oh no, oh no" she'd say as she pointed to the door and said "dada". I explained that he was working inside the house, and didn't need his hat, she said "okay" and put it on to model it for the camera. The last few days, Lallie has been experiencing lots of new things. 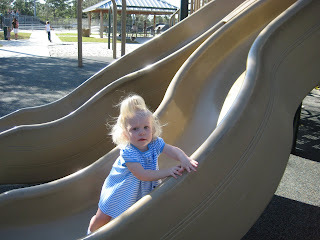 Lallie really didn't want to go home, she wanted to stay at the park and play, play, play all day, day, day! 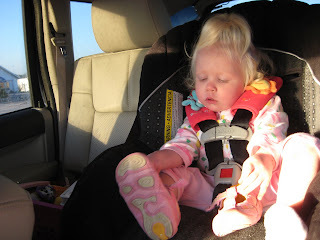 On Monday, Lallie learned how to put her shoes on (she learned how to take them off a LONG time ago). She has been practicing putting them on constantly since then. 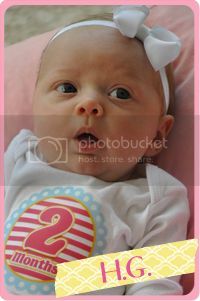 Here is a picture of her in the car when she first learned to put them on. She was so proud of herself and clapped and had a big grin when she realized she had learned something new! And then yesterday, oh my, yesterday was a very big day! With great distress and sorrow, we put away the high chair and got out Lallie's new booster seat! Lallie was very upset and confused at first when mommy folded up and put the high chair away. 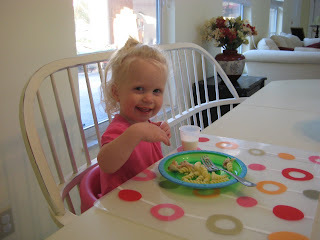 But, as soon as she saw her new booster seat and table mat, a release of instant joy resulted and she proceeded to eat her dinner with great enthusiasm! 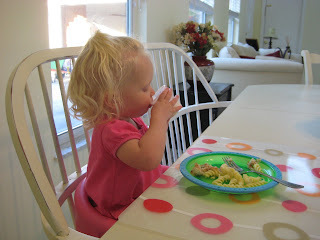 Lallie is also now using a big girl cup (well, a solo cup)! She is very gentle with the cup to make sure she doesn't squeeze too tight and she's very good at judging how high to tip the cup. Of course, we still go milk everywhere, but it sure was fun trying! It's amazing all the new things we are learning. Time flies by when you're having fun! The other day, Lallie was exploring the bookshelves and found a brightly colored book that I had made Husband for our 2nd anniversary on June 15th, 2004. It is called The Book of Snoof: A guide to the ~isms of a Snifferwoose." In other words, it's a book of "Jennifer Stories" as Husband likes to call them. A book to remember all the silly stories of our family life, so that we can remember the funny times and of course, tell the entire world (as Husband has proceeded to do so) of the silly things his wife says and does. Keeping this idea in mind, and considering Lallie was the one who found this long lost book, I have decided to do the same for her.... a blog of funny stories and things that Lallie does on a day-to-day basis and are too cute to forget, but unfortunately, we do forget. Hopefully, over the years, we can record these stories for ourselves and for her (and her future boyfriends, for embarrasment) while at the same time, sharing these funny incidences with our friends and family who live so far away from us. 1) Lallie and I were at Publix shopping. I used to be able to take her without a fuss. She enjoyed watching all the people and looking at the brightly colored store items however, she doesn't enjoy this nearly as much as she used to and we often end the grocery trip with a temper tantrum.s But, not on this particular Sunday! 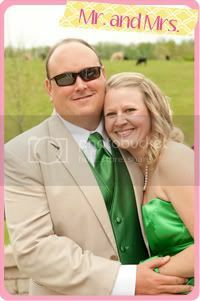 We had just gotten out of church and both in our Sunday best. Lallie had been playing with a toy flip-phone and insisted on bringing it to the store with her. She walked up to the store (holding her hand of course) and as soon as she saw the big green car cart, her eyes lit up and with a big smile, pointed and laughed as I lifted her into the car. We shopped and all the while, Lallie was grabbing everyone's attention as she drove the big green car with one hand, had her flip-phone to her ear in the other, and was clearly having a conversation with someone on her phone. I guess she's been watching mommy....monkey see monkey do! 2) Once again, we're shopping and I picked up a brightly colored box of crackers that Lallie just HAD to have. We pulled up to the cash register and she knew the box was going to be taken away from her (so I could pay for the crackers). It took no more than five seconds to take the box from her, have it scanned and hand it back to her, but her face got bright red, one tiny tear drop fell from her eye and she puffed up her lips and glowered at the poor man behind the cash register. I told the checkout person "boy, you sure didn't make a friend today!" to which he replied "by this time in the shopping trip, I rarely do!" 3) We're in the middle of a kitchen remodel, so we've been eating take-out meals quite a bit lately. After work, I stopped by Publix to pick up a rotisserie chicken and meal which is at the front of the store. The entire time, Lallie was yelling (quite happily) at the top of her lungs, "BALL, BALL, BALL" and pointing. I thought she was pointing at a balloon, and I was correcting her as she does know how to say balloon ("ba-boon"). As we walked away from the deli counter, she continued pointing and yelling and then started to cry. Obviously she was quite enthralled with whatever it was she was interested in, that we turned around to go see. Lallie had been pointing out the huge rack of bouncy balls of all sorts and sizes. This rack was all the way at the back of the store, I couldn't see the rack. Lallie's eyes lit up when she saw this huge, bright pink ball with Disney princesses on it and she had to have it! She had been a trooper, so I got it out and she held it with a huge grin all the way to the register. The ball was significantly larger than she which of course, got her lots of cute compliments from other shoppers. BUT, then we pulled up to the register and Lallie clearly remembered the man behind the register from our last shopping trip. She winced and glowered at him and spoke her mind to him with loud, snappy words until he gave the ball back to her. She started at him with one eye clinched until we left the store. Once we were out, her huge grin returned and she held the huge ball all the way home in her carseat, she couldn't even see around it!